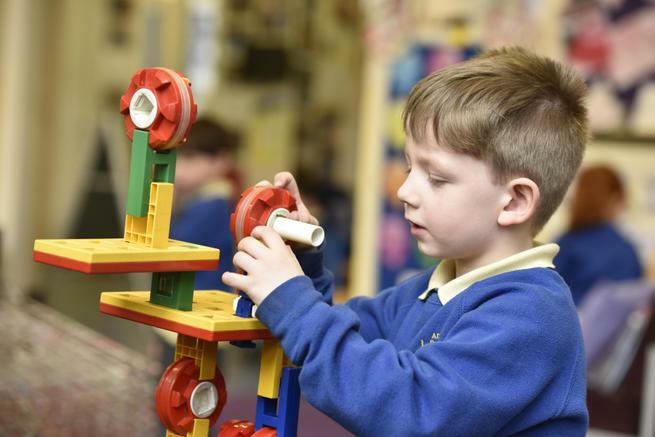 There are currently 39 full time places in our Nursery and we have excellent, experienced staff who deliver a curriculum with a strong emphasis on play and enjoyment. All children are encouraged to join in with a rich variety of activities daily; each activity developing the 7 areas of the early learning curriculum. We take a holistic approach to learning treating each child as an individual who is listened to, supported, challenged and encouraged. Combine this with a happy, stimulating, purposeful atmosphere and you have the ingredients for your child’s best possible start. We have a marvellous room with dedicated areas for carpet time and curriculum areas. The Nursery children have direct access to a stimulating outdoor area. Excellent use is made of local amenities including the parks, the local shops and the market. The joy of learning is a crucial foundation to lay at this early stage of education and we value the partnership with home to ensure a link for the child and a sense of security and happiness. You are welcome to join your child for ‘Stay and play’ and ‘Time for Rhyme’ on the first Wednesday of every month. Every child has a key person who is responsible for a group of children. Records of development and care are created and shared by the key person, parents and the child. Small groups foster close bonds between the child and the key person in a way that large groups cannot easily do. These groups allow the key person to better ‘tune into’ children’s play and their conversations to really get to know the children in the group well. Children feel settled and happy and are more confident to explore and as a result become more capable learners. Parents wave “bye bye” and children go to their groups for greeting time. Children take part in either focus activities with an adult or are engaged in child initiated learning. Children can choose to play inside or outside. Children take part in either focus activities with an adult or are engaged in child initiated learning. Large group time – this is a chance for all the Nursery to meet together and talk about our learning. Lunches are designed to encourage children to try a range of foods that are cooked at home but within the setting of the school hall with friends and staff. Children are shown how to eat correctly with a knife, fork and spoon, how to converse with friends, how to cut food, etc. The menus are changed every half term. Mrs Janet Smith on 020 7385 2107.